We do like taking drives off Phuket island, over the Sarasin Bridge and into Phang Nga Province. Phuket is the biggest island in Thailand, but Phang Nga is 8 times bigger than Phuket, so we are still finding new places to visit not far from home. Phang Nga has plenty of well known places like Khao Lak, James Bond Island, Lampi Waterfall and much more, but recently we've been exploring some lesser known areas. A few weeks ago we took a drive around the Khlong Kian area which is itself about half the size of Phuket and has some lovely views. 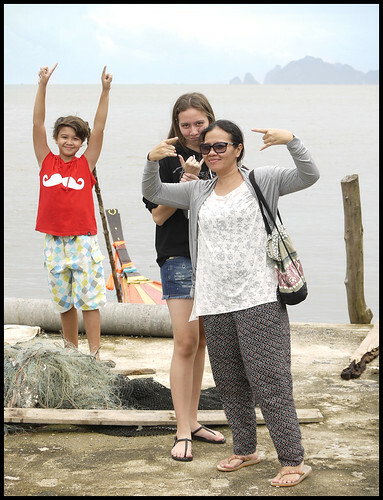 To the east of Phang Nga Town, off the main road to Krabi (a road we have driven many times) you find Bang Pat. I first heard of Bang Pat about 4 years ago when I saw it on a Thai TV channel, and have always intended to stop there, but somehow never got around to it until last weekend. I knew that Bang Pat has some restaurants, but on this little trip we decided to eat first, and then go check out Bang Pat. We had lunch at Dairy Hut Seafood, a very nice place in between Phang Nga town and Bang Pat. We've eaten there several times before. The turning off the main road to Bang Pat is about another 6km past Dairy Hut on the road towards Krabi. The turn off is not too well signposted, but it does say "Bang Pat" in English, just not in huge letters! 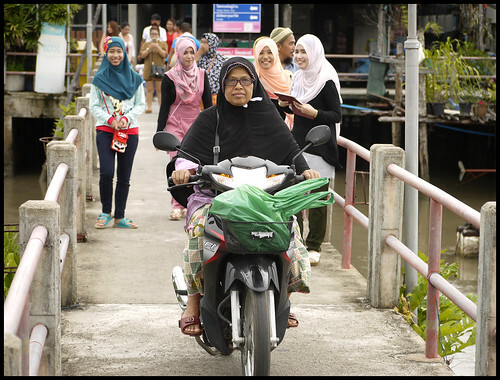 Then there's a 10km drive on a small road through little villages, passing lots of agricultural land and lots of shrimp farms as the surrounding area becomes mostly mangroves. At the end of the road - a car park, toilets and some stalls selling food. I was surprised to see so many cars! Can this place be so popular. It was hard to find a parking spot, must have been at least 50 cars there. Then I realised it was the first weekend after the end of Ramadan. 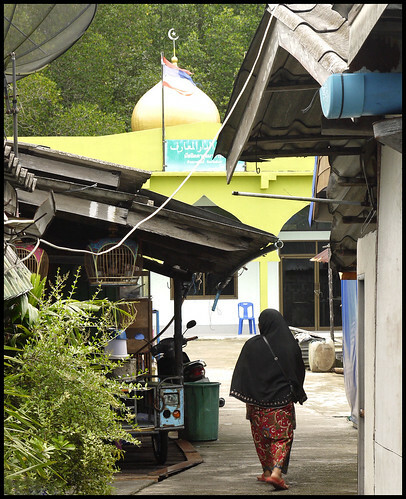 And Phang Nga is a largely Muslim area, so Bang Pat was full of local families out for a big celebration meal. I would imagine any other time it's not so busy. I was a grey day also, with some light drizzle in the air, not ideal for photos - this means I think we have to go again to get more photos and try a restaurant when it's less crowded. 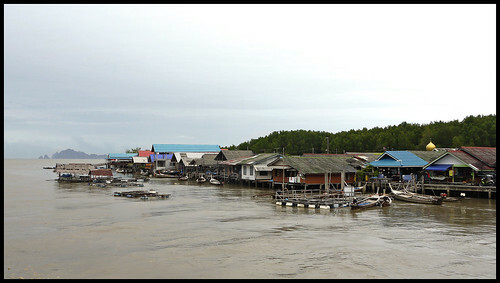 Bang Pat is a fishing village built in the mangroves just at the entrance to the open sea (part of Phang Nga Bay). Seafood is the business around here - fish, prawns, crabs, shellfish. 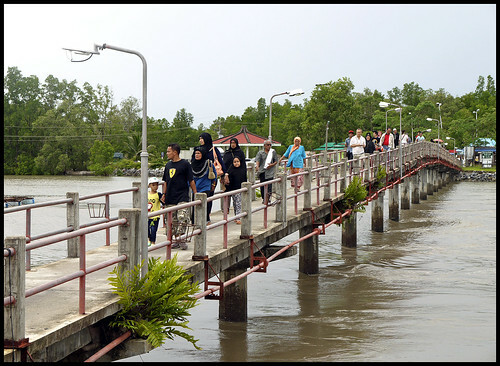 The village is on the other side of a wide mangrove creek, so you walk over a bridge, about 150 meters over to the village. (above) Bridge over to Bang Pat - it was quite busy when we visited! It's not a big village, smaller than the well known Panyee Village in Phang Nga Bay. My first thought was that it looks a little run down, although I think the grey skies did not help! We turned left off the bridge and I went off exploring the side streets. 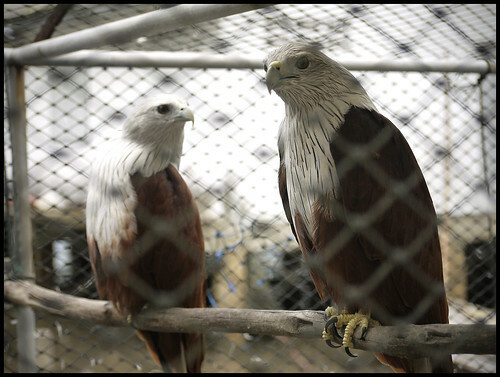 We found several houses with caged eagles (or brahminy kites?) outside. See photo below. Not sure if these are being kept as pets or if they are somehow used to help with fishing. If anyone reads this who knows the answer, please do let me know! The restaurants were very busy on this day. I think on a sunnier day, could be a very nice place to have a seafood lunch. I counted about 6 different restaurants and also saw one sign for a homestay. An article in a local news site from 4 years ago says there were 10 homestays. I think maybe that was a little ambitious, but the restaurants at least seem to be running and fresh seafood is certainly guaranteed. OK, there's not a huge amount to see here at Bang Pat - it's not a day trip on it's own, but combined with a few other nearby things it's worth a visit. 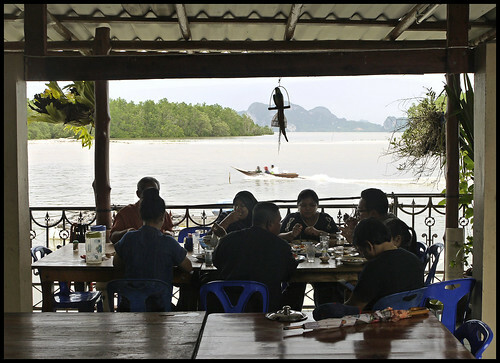 It would be an option for a lunch before renting a longtail boat out into Phang Nga Bay for example. We just wandered around for about 40 minutes and then with more rain coming in, it was time to drove home. From our house about 90 minutes to Bang Pat (we live near Phuket Town). Just about anywhere in Phang Nga is OK for a day trip or even a half day. On this day we did not leave home until nearly midday. And as I said, I think we need to return to try some food and see the place on a sunnier day! (above) Heading back over the bridge - look out for mopeds! It was a popular day for local Muslims to visit. Looks like people were having a fun day out!